Charles Elwood (Chuck) Yeager was born on 13 February 1923 in Myrna, WV. Enlisting in the Army Air Forces in September 1941, he began as an airplane mechanic but soon applied for flight training. Upon graduation from Luke Field, AZ on 10 March 1943, he was warranted as a flight officer. Assigned to the 363rd Squadron, 357th Fighter Group, flying P-51s from England in early 1944, on 4 March Yeager shot down an Me-109G and damaged a He-11K. 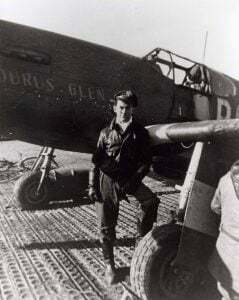 The next day he himself was shot down over southern France, but evaded capture and returned to Britain via Spain. Returning to combat as a first lieutenant, he shared in the destruction of an Me-109 on 13 September and on 12 October shot down five Me-109s between Steinhuder Lake and Hannover. Promoted to captain, he added an Me-262 jet to his bag on 6 November. He rounded out his scoring with four Fw-190s on the 27th. In July 1945 Yeager went to Wright Field to begin experimental test work. There he was selected to pilot the rocket-powered Bell X-I, in which he became the first pilot to officially exceed the speed of sound on 14 October 1947. On 12 December 1953, flying the Bell X-IA, he became the first man to fly at twice the speed of sound. Yeager commanded two fighter squadrons from 1954 to 1960 and became commandant of the Aerospace Research Pilot School in 1961. In 1966 he assumed command of the 405th Tactical Fighter Wing and flew 127 missions in South Vietnam. Promoted to brigadier general in 1969, Yeager became vice-commander, 17th Air Force in Germany. His final assignment was Air Force Director of Safety before retirement on 1 March 1975. He continued to fly firstline aircraft as an Air Force consultant. Clarence E. “Bud” Anderson Jr.
There’s still time to apply for the 2018 American Fighter Aces Association scholarships! Welcome to the NEW American Fighter Aces Association website! Join us in Texas for the American Fighter Aces Association Annual Reunion! The American Fighter Aces Association is a non-profit 501(c)(3), non-military and non-political organization committed to preserving the distinguished heritage of the American combat fighter Ace and impacting future generations through education and scholarship.